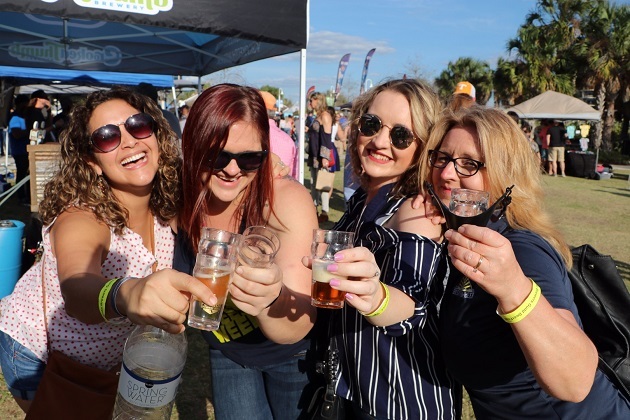 Get ready to guzzle down some of Tampa Bay's best brews because the 2019 Florida Brewers Guild Craft Beer Festival is coming soon! On March 2, head to Perry Harvey Sr. Park in Downtown Tampa between 2 p.m. and 5 p.m. for craft beer, tasty food truck fare, and lots of fun in the sun (or rain- the beer must flow on) while kicking off Tampa Bay Beer Week 2019, sponsored by the Florida Brewers Guild. This year's Craft Beer Festival is on track to be better than ever! Craft beers from more than 70 Florida breweries, live music, and the best local bites, this festival is the place to be in Tampa the first weekend of March. The featured breweries have yet to be announced, but you can expect to pair your craft beer with grub from Jimmy's Slider Truck, St. Pete Taco Lady, WING BOX (our favorite kind of Bird Box), and Hott Mess, serving lots of tots and more. General admission to the Craft Beer Festival is $50 at the gate ($45 in advance) and includes unlimited samples of Florida's best craft beer and a commemorative tasting glass. If you're thinking "So much beer, so little time," then Upgrade to a VIP ticket for $65 and get an extra hour of tasting with VIP early admission at 1 p.m.! With so much beer and cheer, the Craft Beer Festival provides perfect prelude to Tampa Bay Beer Week, a series of events shining a spotlight on local breweries, distributors, and vendors. Other than enjoying everybody's favorite bottled (or canned) beverage, the ultimate goal of Beer Week is to celebrate Tampa Bay's emerging beer culture including its diverse, vibrant craft and specialty beer, cider, and mead scenes. Our community is blissfully lucky to be able to boast one of the country's best beer communities fostered by loads of dedicated lovers of the brewing crafts. The first Tampa Bay Beer Week was inaugurated in 2012 and has grown exponentially ever since thanks to the Florida Brewers Guild. A 501(c)6 not-for-profit organization, the Florida Brewers Guild is an organization dedicated to preserving the interests of craft brewers throughout the state of Florida, both big and micro. The guild also promotes networking and educational opportunities between brewers, suppliers, consumers, and government agencies. If you go to the Craft Beer Festival on Saturday and want to continue your celebration of beer, head to Water Works Park the next day between 11 a.m. and 5 p.m. for the 2019 Brewer's Ball. Remember to BYOC (Bring Your Own Cup) because this is a self-pour event. You definitely won't want to miss out on the Brewers Ball After Party starting at 6 p.m. at Tampa's infamous temple of craft beer, The Independent Bar and Cafe in the historic Seminole Heights. Featuring no cover, some of the Heights' best musicians, and old-school grill grub, this is the perfect low-key event to cap off a great weekend of enjoying craft beer! For the full list of events for Tampa Bay Beer Week 2019, check back to their site as more additions become available. Find more awesome events in Tampa like Tampa Bay Beer Week and register on 813area, your local free guide to everything going on in Tampa Bay!